I don't really have a whole lot to say about this mysterious pattern. It seems to only have been available on the P-43-B and no other pieces. The official name has not been verified, but "Bistro" and "Cafe" are a couple of the names that people often use when referring to it. 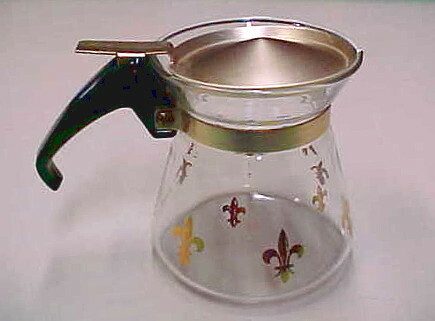 I have even seen it called "French Coffee Shop". One thing to note, however, is the flat topped lugs. 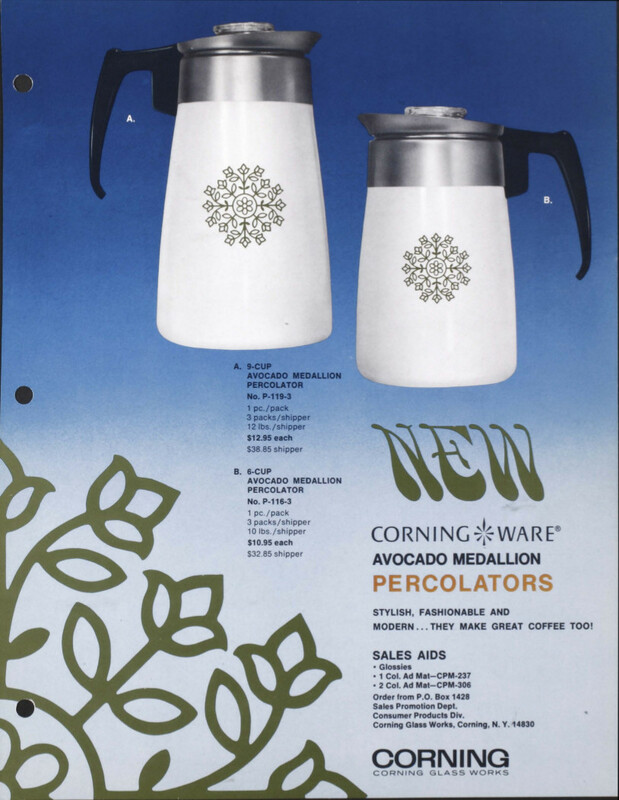 This dates the piece to after 1996, which was the point when Corning Glass Works flattened the lugs of the P-43, as is evident for later patterns like Lyrics, Fruit Basket, Fresh Cut, Friendship and Oceanview. 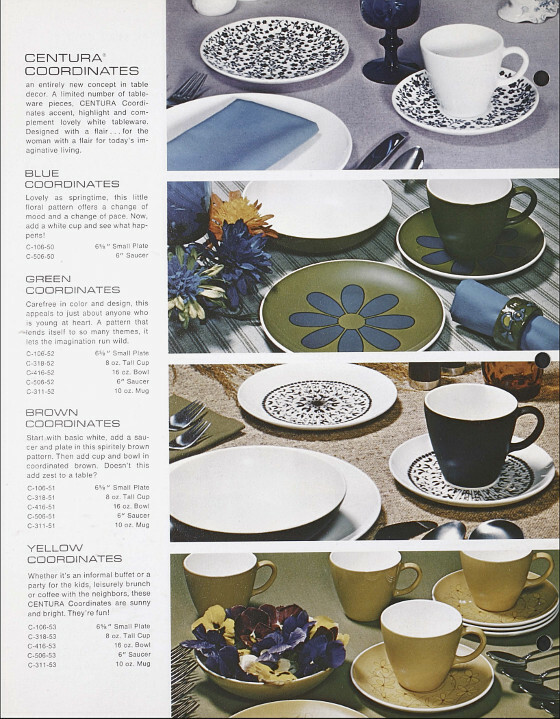 I don't talk about Centura and Pyroceram Tableware as much as I probably should. 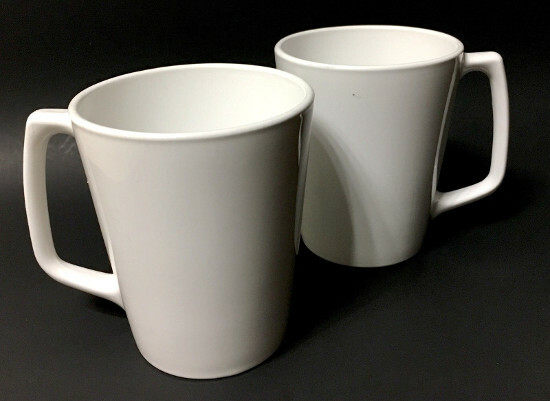 It IS, after all, a form of Pyroceram, just like Corning Ware. 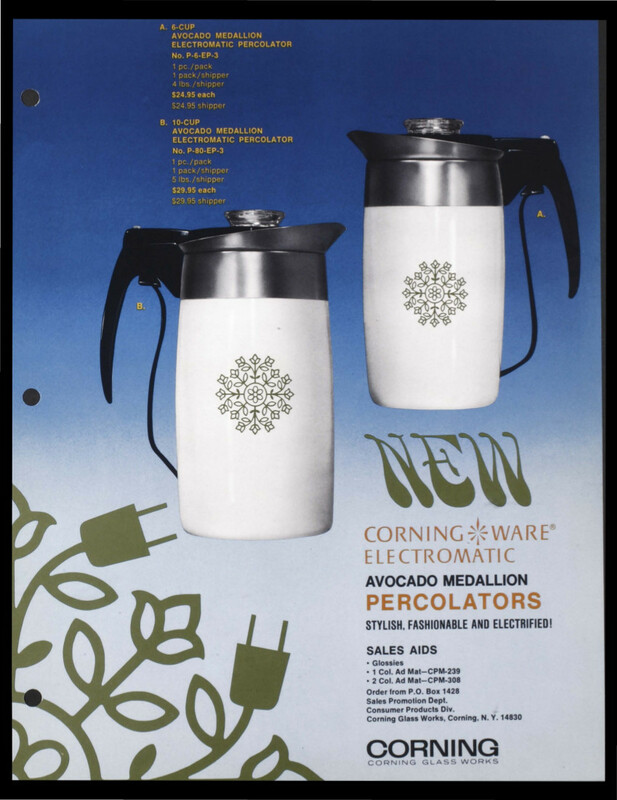 But I usually hang with the Cook n' Serve items that were made of the actual Corning Ware formula, instead of the Centura Pyroceram items that are not safe for microwave use. I think this has something to do with the Ion Exchange strengthening process that Centura goes through. 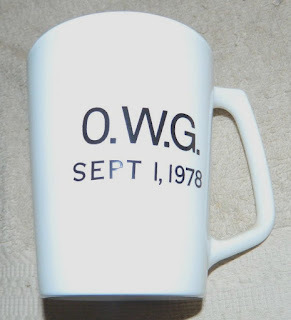 Be that as it may, today I would like to ramble along on the subject of the 10/11oz mug model number C-311-some number (depending on the pattern or color). 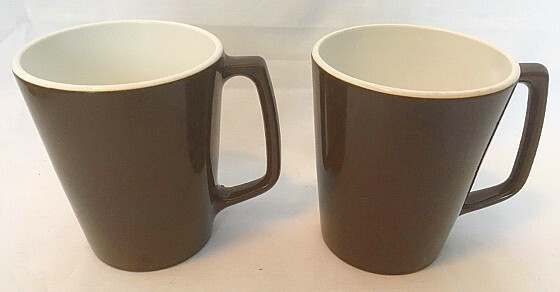 They were listed as both sizes in marketing materials, depending on whether it was the 60s or the 70s and were manufactured between 1964 and, at least, 1980 maybe slightly longer. but also in Avocado Green, Gold, Yellow and Brown. 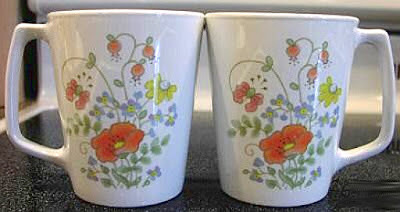 Corning Ware patterns jumped over to these mugs as well (Sorry, No Blue Cornflower). 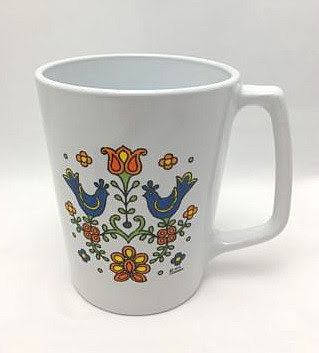 Then there is the Centura pattern known as "Game Birds". It is unclear if all of the birds were available on the mugs or not. The only one I currently own is the Ruffed Grouse. There is also the set of 4 flying game birds, that are unrelated to the Centura Dinnerware pattern. 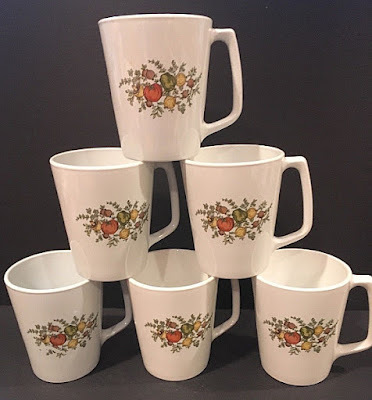 These particular prints seem to have been extremely popular with several companies over the years and the same patterns will crop up on miscellaneous items like Teapots, Tea cups, Plates and bowls all made by different manufacturers out of different materials. Not related to the above set, is the bird dog retrieving a mallard mug... I am not sure if there are more bird dog mugs or not. 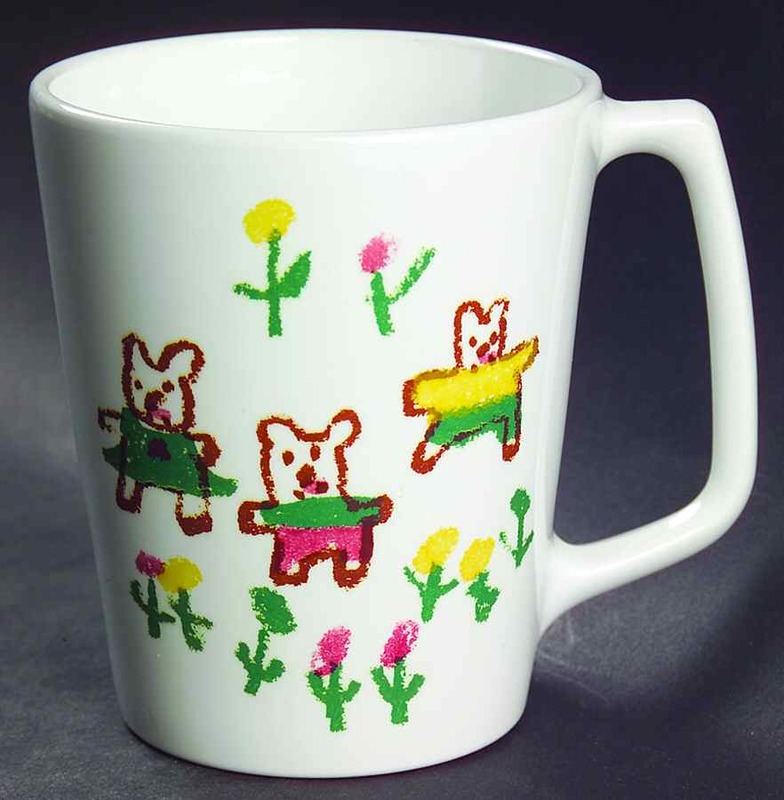 Completely unrelated to any game birds or dogs is the set of 4 Golfer mugs. There are also a bunch of miscellaneous promotional prints as well. Though how many there are, is unknown at this time, but here are just a couple of the designs. 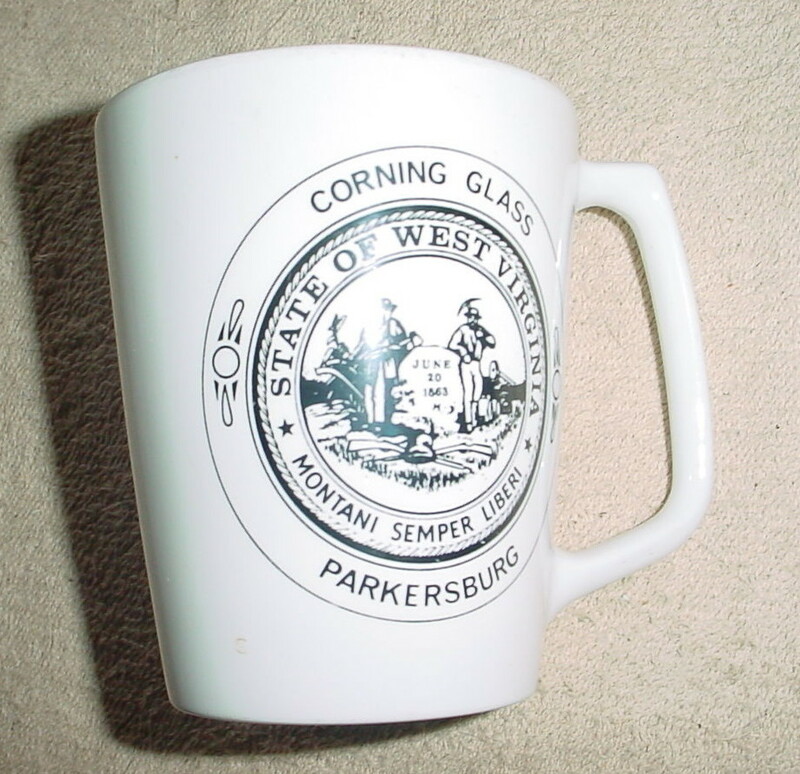 Since it is somewhat traditional, at this point in time, to reminisce about the previous year, I would like to focus on the biggest Corning Ware mystery to surface in 2017. It took a bit of luck to secure one of the four that have appeared on eBay over the last 6 months, but I finally succeeded. 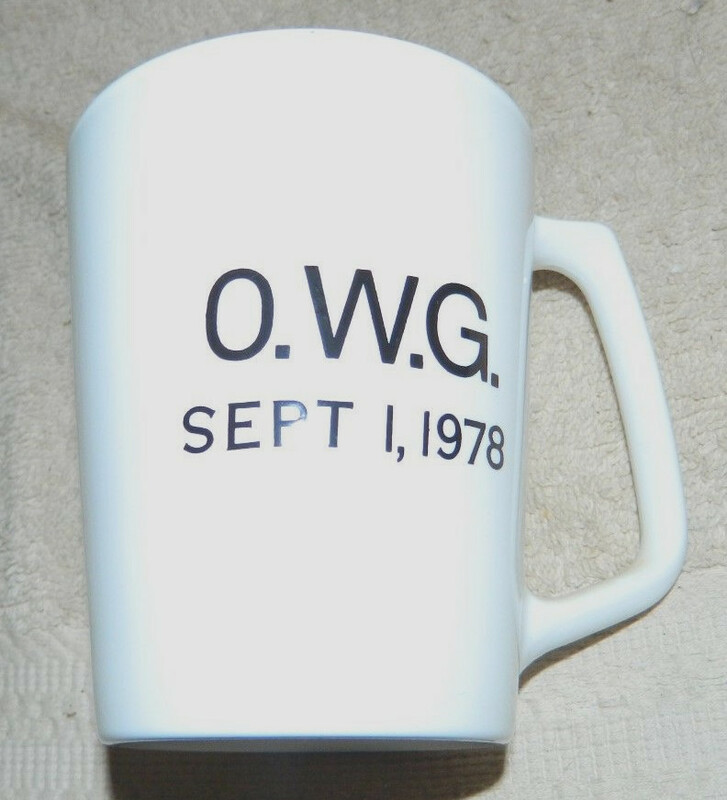 Of course, because Murphy is my Uncle, I promptly found a damaged one in a thrift store 3 days after the eBay seller had shipped the one I purchase. So now I have 2 of them, or 1 4/5 of them, depending on how you look at it. The mystery piece I am speaking of is this 2 cup "teapot" with the aluminum lid. 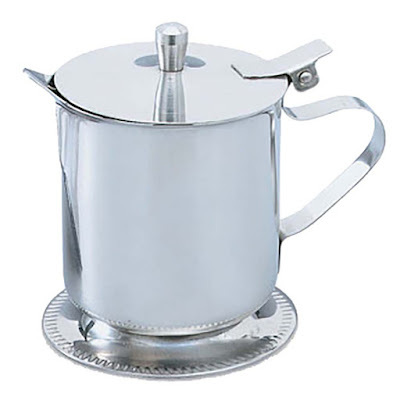 Especially with the way the lid is attached. 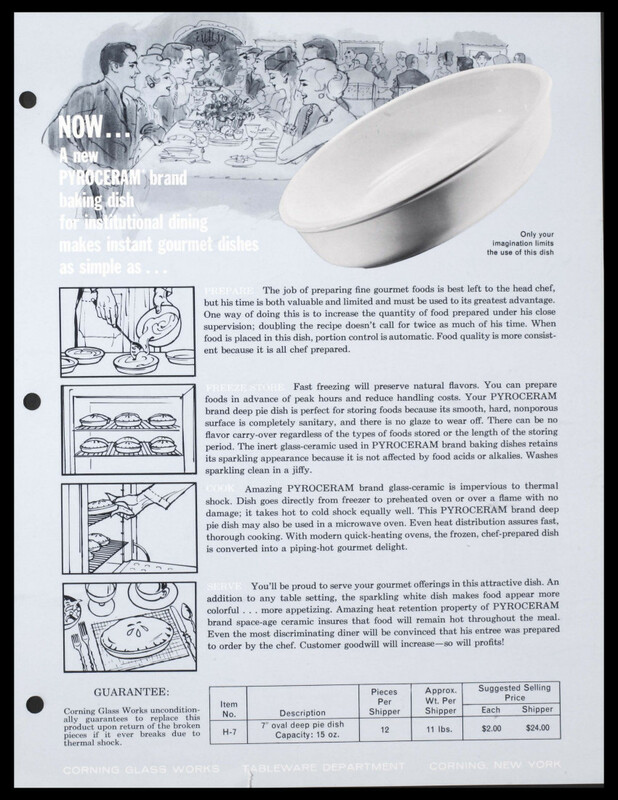 I kind of wonder if this is a product of the same phenomenon as the H-7 au Gratin/Deep Pie dish piece. Which was really a Hospitality Industry item, but they do show up from time to time with Cornflowers emblazoned upon them, instead of the standard plain white. Likewise, these cream servers/individual teapots may have also escaped their hospitality destiny to be flocked in blue flower. I am guessing that they might be a P-102... But they could just as easily be an H-102 or just an H-2. Heck, they could have even been PL-102 if they were intended for the airlines. Who knows. I only have access to 2 documents regarding Hospitality items. One document focuses on the warming buffet style servers and the other is about the H-7 individual pie dish (seen above). As far airline items are concerned, I got nothing. So your guess on this piece is just as good as mine. Then again..... It looks an AWFUL lot like the individual Pyrex carafes that were produced from 1958-1960ish.